Good news for frequent mobile phone users and music enthusiasts this is the sustainable answer to the expensive and ecologically-damaging batteries. Using solar-powered battery chargers, you set an example. You use the power of the sun to run your phone, PDA or mp3 player. This is interesting not only for eco-freaks, but also for nature lovers, who themselves do not want to be cut off from the outside world in the desert. 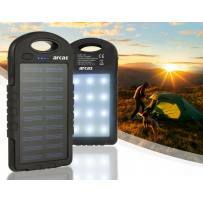 Solar-powered battery chargers charge your electronic gadgets directly in the sun. Different adapters are included, depending on the model, which you can use to charge suitable gadgets. Some solar-powered charging devices have internal batteries, which serve as storage for excess energy. If, for once, the sun isn't shining, you can charge your end device directly from the internal batteries or you can take them out and use them inside the end device. Many solar-powered battery chargers are not bigger than a packet of cigarette and will fit in any waistcoat pocket, which is ideal for when you're out and about. But why put them away, when you can show off these eye-catching technical marvels in the sun.